We are pleased to include this newspaper article about the Peculiar People from Robert Harrod who descends from one of the Bishops of the PP. The article comes from a Southend Standard of 1925. It was in a poor condition but between us we have managed to sort it out. A transcript of the article is below and under it are some comments from Robert. He has also left an additional comment under this earlier article on the site about the PP. MANY MOURN LOSS OF MR. G. F. HARROD. A funeral procession quite half a mile in length and including twenty-seven private motor cars and several charabancs was an impressive feature of the interment, on Friday, of Mr. George Frederick Harrod, a prominent local Elder of the Peculiar People, whose death was recorded last week. He passed away on the previous Sunday, at his home, 33 Southchurch Road, in his 66th year. Besides being an earnest member of his religious sect, Mr Harrod was well-known for his work in Southend during the war in connection with the V.A.D. Friday's service took place at St. Ann's Road Chapel, where deceased was a regular worshipper, and the building was crowded. Many sympathisers came from outlying districts, their cars lining both sides of the road. Elder Joseph Wagstaff conducted the proceedings, assisted by Elders J. Thorn, J. Southgate, C. Shelley, J. Cooper, and G. Anderson. The service opened with the hymn "Thee we adore, eternal Name," followed by fervent prayer and the hymn "Jerusalem the Golden". After the reading of the burial service several present spoke of deceased's character and life and made feeling reference to the loss sustained by the family and the Church. Before the close of the service were sung the hymns "Servant of God, well done" and "What through the arms of conquering death". The long cortage was then formed and proceeded to Sutton Road Cemetery where Elders Wagstaff and Thorne peformed the last rites and the large assembly rendered the hymns "Religion shall be all my choice" and "Shall we meet beyond the river?". Inscribed on the coffin was: "George Frederick Harrod, passed away August 9th, 1925, aged 65 years. For ever with the Lord". There were no flowers by request. 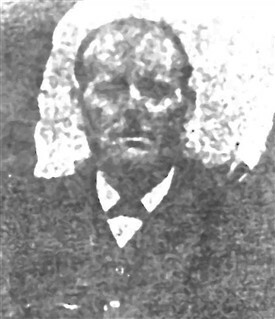 Messrs. J. W. Tate and Son, of North Road, were responsible for the funeral arrangements. The principal mourners were: Mrs Harrod (widow), Messrs. George, Hubert, Frank and Walter Harrod (sons), Mr. and Mrs. W. Morgan, Mr. and Mrs. H. Matthews, Mr. and Mrs. F. Ager and Mrs. E. Stubbs (sons-1n-law and daughters), Mr. F. G. Harrod (brother), Mr. and Mrs. R Clark, Mr. and Mrs. J. Perry, Mr. and Mrs, A. Perry, Mr. and Mrs. E. Thorington (brothers-in-law and and sisters) and Mr. and Mrs. C. Thorington. The death of the late Mr. G. F. Harrod revives memories of an old religious controversy, for he was a nephew of the famous Bishop Samuel Harrod who was "dethroned" rather over 30 years ago. The affair created no little stir in the community of the Peculiar People of that date, for the Bishop was regarded by many as a devout spiritual leader. Consequently the village of Thundersley witnessed an extraordinary scene, when, on a March Sunday morning his rival, Elder Daniel Tansley, of Canning Town, informed the brethern assembled outside the Chapel that Samual Harrod had been deposed from the office of Bishop. Into the highways and by-ways went Elder Tansley and his colleagues, perambulating the parish and proclaiming their sentence. But there was a more dramatic episode to come, for on the following Sunday the ex-Bishop was to be found seated in his accustomed place in the Thundersley Chapel before a very depleted congregation., remarking, "I expected some friends from Southend, but it does not look as if they are coming," he launched out into the service, which included a remarkable prayer for the divine blessing "in this cloudy and dark day". Numerous addresses were given by his supporters, in the midst of which Elder Tansley and his adherents arrived from Rayleigh. After Bro. Terry, of Leigh, had declared "I don't believe in all judgments and no mercy." Elder Tansley desired to speak, but the ex-Bishop declined permission, adding that he, himself, was not going to speak that morning. There were, he said, various things which he wished to say to his brothers and sisters in the Church, but he would not do so before "a lot of lost people, who had only come there out of curiosity". Ultimately Bishop Harrod urged his "persecutors" to leave, and intervention ceased till the end of the meeting, when he was escorted home, taking not the slightest notice of his opponents. Seven chapels adhered to Bishop Harrod's jurisdiction and more than double acknowledged Elder Tansley's leadership, though he was not definitely elected Bishop. That year there were two harvest festivals of the community. The Tansleyites assembled in force at Chelmsford when an "official" message was read from the Elders alluding to the "cutting off from fellowship of Bishop Harrod". "Are you with your Elders?" queried Bro. Tansley, and "Yes!" thundered the thousand Peculiars assembled in the Corn Exchange, and in response to the question "Who is on the Lord's side?" they shouted "All!, All!" and sang "We are on the Lord's side" en masse for some time. Meanwhile, Bishop Harrod held his autumnal gathering at Maldon and expressed thanks that he and his supporters had been "preserved from the Devil". "I have," he said, "been ashamed of the disgusting things they have said against me, and I can tell you that nineteen out of every twenty of them are lies." As the result of the controversy, he formed the "Original Peculiar People", but his death ensuing in 1897, he did not long survive his "dethronement". Thank you for your help and time. I have sent you a re-scanned picture that I have lightened but im afraid its still not that clear. Also the missing text from the newspaper. The missing text reads "I expected some friends from Southend, but it does not look as if they are coming, he launched out into the service, which included a remarkable prayer for the divine blessing." Thank you for putting the information on the site, I'm hoping it might bring some new leads, as well as providing some local history for all interested parties. I have also been looking for St. Anns Road Chapel but have been unsuccessful - maybe it has been demolished. I'll now put the newspaper article you sent on the site together with an edited version of your comments. Have just finished converting the newspaper clip to text but there is a small problem. If you look at the bottom of the first column there is a discontinuity. Is it possible for you to fill in the missing text in the following extract? "I expected some friends from Southend, but it does not look as ... the divine blessing "in this cloudy and dark day". Also, have you a better photo of George Harrod (or could you please rescan the newspaper clip with the photo taking up more of the scan)? Thank you for a quick response,and all your help, I really don't have a problem with sharing my e-mail and any information shared with yourself to be posted, but of course I do understand that the final decision is yours. 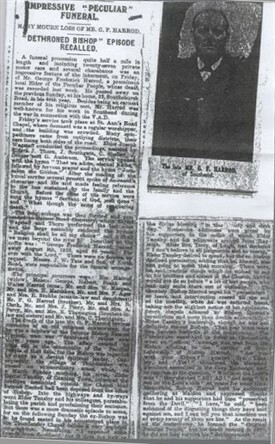 I am trying to find my family history on my fathers side, my father is still alive and 86 years old, my fathers grandfather was Samuel Harrod a member of the Peculiar people, and also his son George Frederick Harrod who was a Bishop in the Peculiar people, who the newspaper article is all about. This is all I have managed to find out at the moment, but this has only come about after coming across your post about the Peculiar people due to the article so thank you. Unfortunately the article is not very clear, and was only discovered when my father's sister passed away and papers were cleared. Pictures, letters, communication, peoples recollections any help of any kind would be really appreciated. I'm just wondering if I need to contact the Southend Standard to see if they keep archives. Also my Father's father was a skilled Shoemaker and the nearest Church to my home is St Andrews, how Peculiar! This page was added by Robert Stephen on 28/11/2016.